Barcelona intend to lodge a formal complaint after Malaga’s coach and owner both appeared to suggest that they’d prefer Real Madrid to win La Liga. With the title race looking like it may well go to the wire this season, Malaga are due to play Real on the final day of the season – thus meaning that the result could be decisive. So you can see why Barca might take umbrage at Malaga coach Michel – who spent 14 years at Real as a player and remains a close personal friend of Florentino Perez – publicly admitting that he would prefer his old side to take the spoils. Michel […] was asked recently about the time another ex-Madrid player, Jorge Valdano, had coached his team, Tenerife, to a final-day win over the Bernabeu club that handed Barcelona the championship. “I’m much more of Madrid fan than Valdano was,” Michel said, suggesting he wouldn’t want to prevent his boyhood team from winning La Liga. 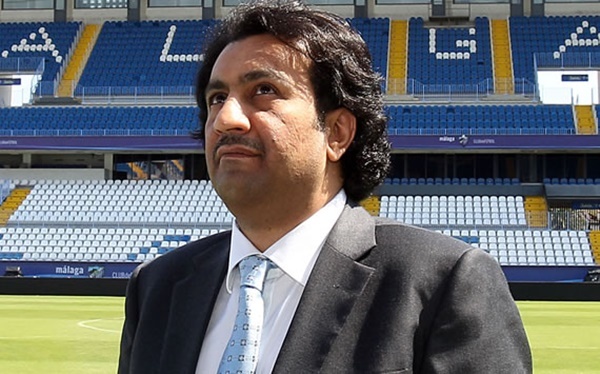 Barcelona expresses it’s rejection and indignation of the content of a tweet published by the president of Malaga CF, Abdullah Al-Thani, with some declarations that assault the very principles of fair play, ethics and legality that must reign over sporting competition. For this reason, the club will formally complain to the Anti-Violence Committee of the Superior Sports Council, and will transfer the matter to the Competition Committee of the Royal Spanish Football Federation, and the Department of Integrity of La Liga. Christ. As if there wasn’t enough petty squabbling up at the top of La Liga already. It is a clear evidence from as many matches involving the los blancos and the favoratism expressed by officials towards them. Off-side goals, and other questionable judgements from referees also attest to this, but the league is still Barca’s. never ever speak about refs if you are a barca fan. ever. stop it.